Our true beginning was in the year 2000, developing websites as part of Worksighted, an IT management and support company. In 2007, we officially launched Blue Sky Sessions to allow us to put a stronger focus on making great websites. Our talented and experienced team has been together for many years, working with many organizations as their dedicated Web team. Our company is located in downtown Holland, Michigan at 25 W. 8th street. Our team works hard to allow our customers to enjoy the web again. Think back when the web was a burgeoning technology and everyone was busy getting a website online. It was a lot easier back then because there were fewer options. Today, the internet offers even more possibilities (almost too many possibilities!). Blue Sky boils everything down and offers sensible solutions that accomplish the goal of the project. It’s that simple! Our goal is to plug into your team as your extended Web department. Most organizations do not have the resources to have a full-time Web engineer on staff. That’s where we come in. We are structured to be your team. We can meet with your marketing team to design a new website or be contracted to handle regular updates. Wherever you need extra help on the web, we’re your team. 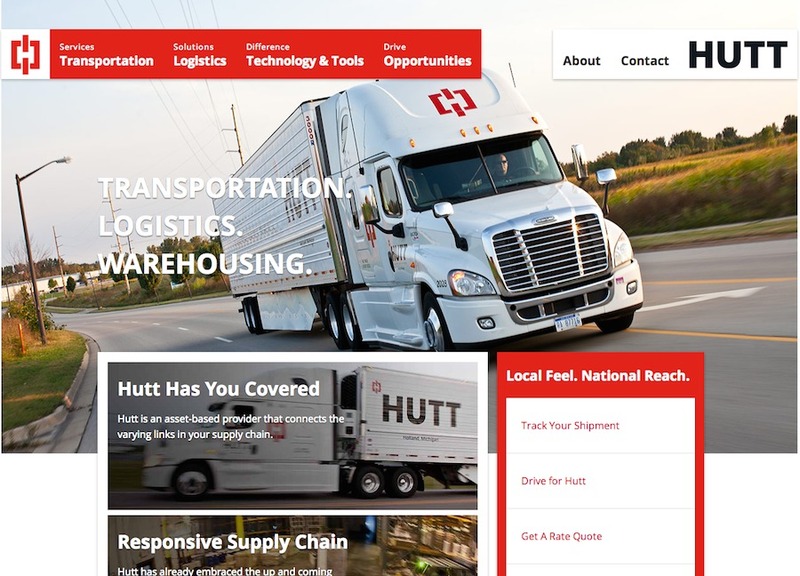 HUTT started working with us initially just to replace their old website, however we soon realized they needed more. We kicked off a rebranding process that brought more strength to their image, while bringing their brand inline with their messaging. On the web we built a responsive site that utilizes Middleman for static site generation, and Foundation framework for responsive grid and UI elements. We also provided creative direction for several photo-shoots that brought this fast-paced shipping and logistics firm to life on the web.